Trust in Digital Life and New Europe organised a half-day roundtable event, hosted by the Press Club Brussels together with the Association of European Journalists. The event brought together representatives from the European Institutions, academia and industry to discuss best practices in the security assessment area. At the time, the EU Cybersecurity Act which was under discussion at the European Parliament and at the Council of the EU was generating considerable debate. 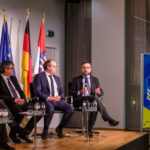 The roundtable invited key stakeholders to share their views on risk analysis, best practices, certification frameworks, self-assessment techniques, and other challenges the EU needs to address to create a safer computing ecosystem for its citizens. The roundtable opened with a welcome from TDL Chairman Amardeo Sarma and keynote speaker, Peter Kouroumbashev MEP. Moderated by Riccardo Masucci (Intel), the roundtable discussion included participation from Professor Bart Preneel (KU Leuven), Dr. Ludmila Georgieva (Permanent Representation of Austria to the EU), Aristotelis Tzafalias (European Commission), Olaf Tettero (Brightsight), Professor Tanja Lange (TU Eindhoven), Aidan Ryan (ENISA), Corinna Schulze (SAP) and Dr. Claire Vishik (Intel). A light lunch followed.